This plate is from a Dutch emblem book highlighting biblical passages with poems and images. 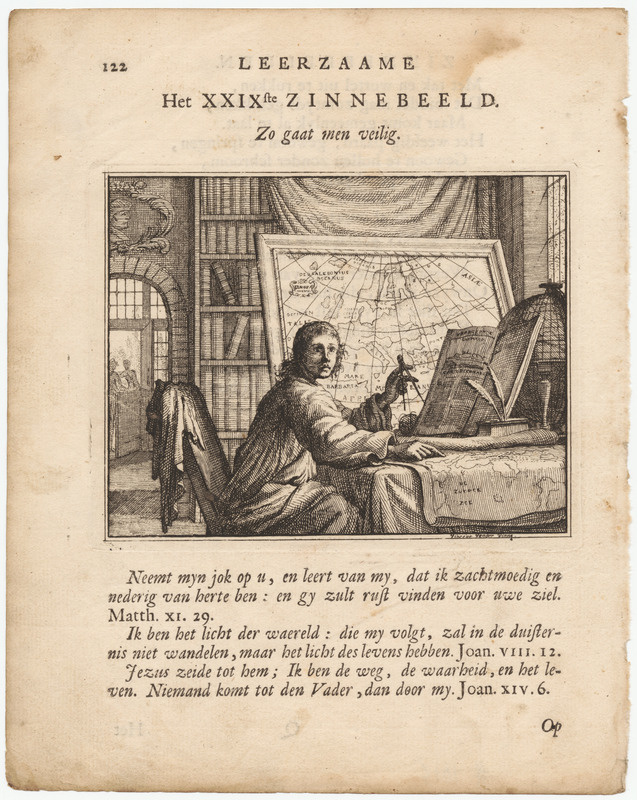 It is a portrait by Vincent Vander Vinne of a mapmaker looking up intently from his charts. The plate is titled “Thus Men Go Safely” (Zo gaat men veilig), and it is used to illustrate the biblical passage, “I am the way, the truth and the life.” See Raybould, Robin. 2009. Emblemata: Symbolic Literature of the Renaissance 29, #14. New York: The Grolier Club. Spinniker, Adianne. 1714. Leerzaame Zinnebeelden [Instructive Emblems]. Te Haarlem: Izaak vander Vinne.